Originally posted: January 24, 2018 . Last modified: January 14, 2019 . 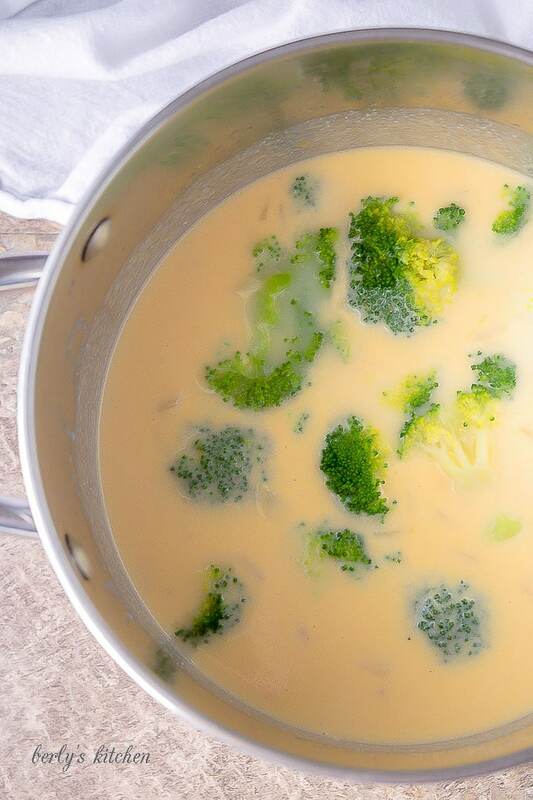 Our Easy Broccoli Cheese Soup is creamy, cheesy, and a great way to add veggies to your day. Top with some extra cheese and more broccoli for a full meal. Soup is a pretty big deal at my house. Both my husband and my son love just about any soup, which is good for me. That means I can make a lot of different kinds like vegetable beef and cream of tomato, and they get to be my taste testers. Since we make a lot of soup, we rarely make the same one twice. So, when I do make a soup for a second, third, or forth time, I go for simple and delicious! 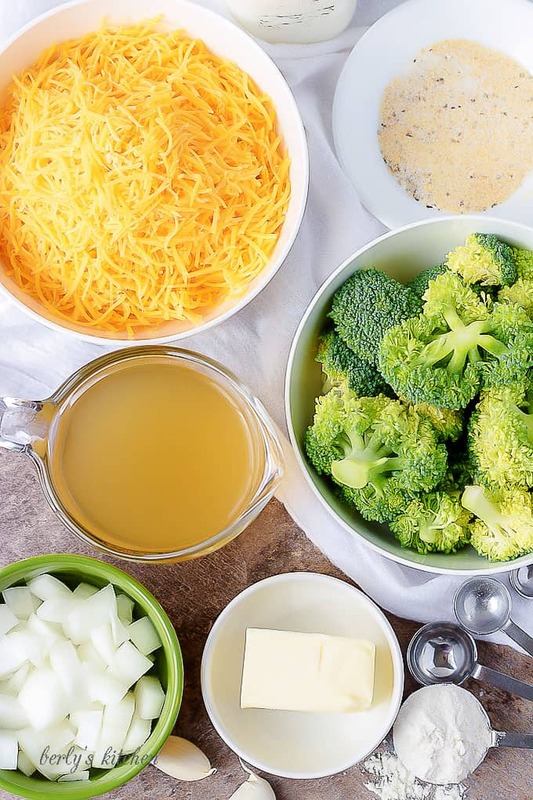 Our easy broccoli cheese soup has me covered. Start by gathering all your ingredients. As you will see from the picture, it doesn’t much to whip up this easy broccoli cheese soup. The hardest part is waiting for the water to boil. So, let’s get started. First, bring a medium pot of salted water to boil, and carefully add the broccoli. Next, cook it for 2-3 minutes until it begins to soften and becomes vibrant green. Now, combine the butter, onions, salt, pepper, garlic powder, and onion powder in a separate large stockpot, and melt the butter over medium heat. Then, strain the water, and set the broccoli aside. Afterward, use a wooden spoon to stir the ingredients and cook until the onions soften, then add the garlic. Cook for an additional 30 seconds to 1 minute. Last, add the flour and whisk well to combine and let everything cook for 2-3 minutes to cook out any raw flour flavor. The roux is done. First, slowly add the milk and broth to the roux, whisk the ingredients to ensure any flour lumps are broken down. Next, allow the mixture to heat and begin to steam, don’t let come to a boil or it will break. Then, slowly add the cheese, about an ounce at a time, whisking in between each ounce. Make sure all the cheese melts before adding any additional. After adding all the cheese, carefully stir in the blanched broccoli florets, reserving 1/2 cup. Last, use a hand blender to blend the soup while it’s still hot or let it cool and pour it into a blender or food processor to pulse until it’s smooth and creamy. 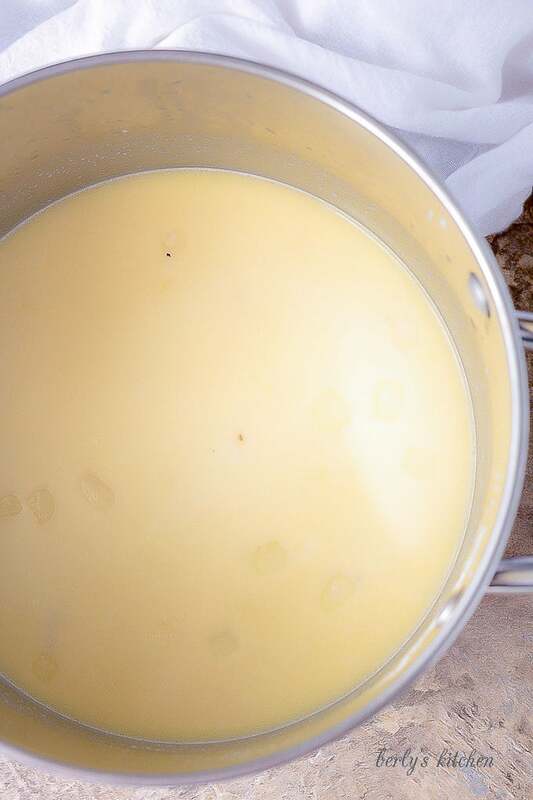 The soup can be frozen and thawed over low heat in a stockpot. Cornstarch can be used as a thickener if the soup is too thin. Remember, the longer the broccoli blanches, the softer it will become. If you love soups, then try our tomato soup or our taco soup! 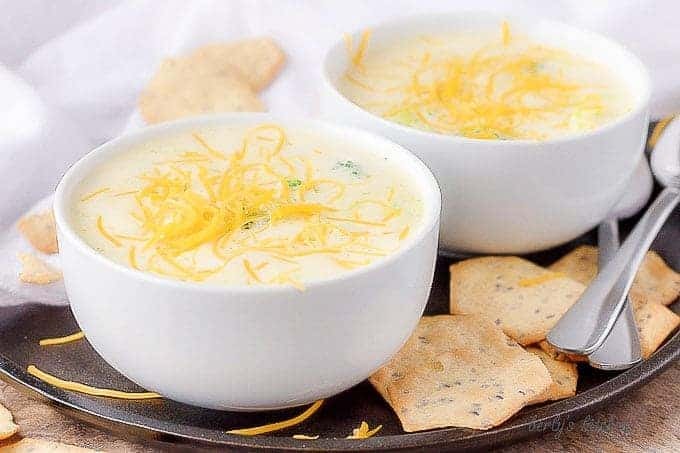 If you like this Easy Broccoli Cheese Soup recipe, please leave us a comment and rate the recipe card. You can also find us on Facebook, Pinterest, Twitter and Instagram searching for Berly’s Kitchen! Blanch broccoli florets in a pot of salted water. Cook for 2-3 minutes until soft and bright green. 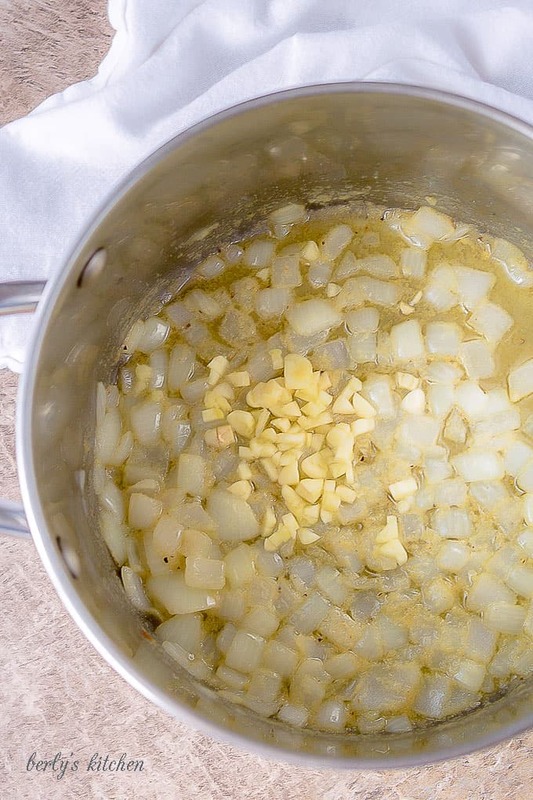 Add the butter, garlic powder, onion powder, salt, pepper, and onion to a large stockpot. Heat over medium heat until the butter melts and the onion is soft. Add the garlic and cook for an additional 30 seconds to 1 minute. Next, whisk in the flour and cook for 2-3 minutes. Slowly add the milk and broth and heat whisk to break up any flour lumps. Continue to heat until the mixture steams and bubbles form around the edge of the pan. Add the cheese an ounce at a time, whisking in between each ounce. Ensure all the cheese melts before adding more. Carefully stir in the 1 1/2 cups of the blanched broccoli. Add remaining broccoli and cheese. Stir to combine. Top with your favorite toppings and serve. The calories listed are an approximation based on the ingredients and a serving size of one cup without toppings. Actual calories may vary. Make it gluten free by using GF spices, flour, and broth. Make it vegetarian by using vegetable broth. Mmm this sounds so hearty and comforting, I need to make this soon! Such a great way to get more veggies in the day! 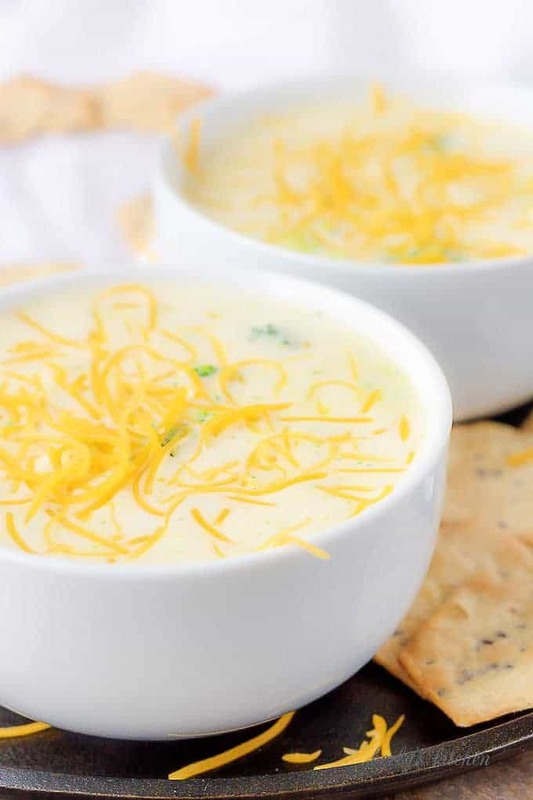 My kids love cheese, but claim to hate broccoli… bet they would like it in this soup! This is my husband’s favorite soup at Panera. But I’m so excited I can make this at home for him. I know he’ll love your recipe! Thank you for commenting Chrissa! It’s my favorite soup as well and making it at home is much better than having to drink to a restaurant lol! I am with your son and husband, I love soup all day every day. This looks amazing and that fresh cheese on top is amaze! Thank you, Kristen! I look for any excuse to eat soup lol. The crazy thing about the situation is Kim makes delicious soups but has never even tried them lol! This looks absolutely amazing, and perfect for cold weather! Yum! 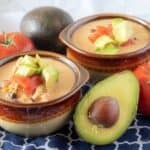 This soup looks great and so does the photography! Broccoli soup is one of my favorites! I haven’t had or made it in far too long. Thank you, Cori! 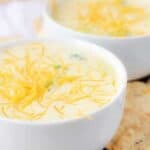 I cannot go too long without some broccoli cheese soup lol! This looks amazing!! Broccoli soup is one of my faves. Love your photos!